Book publishers sometimes sit their authors down for stern lectures. More often than not, the author deserves it, and the publisher knows best. I have recently discovered a contrary example, one that involves you, the reader. Actually, I am referring to not just one but a series of lectures, from two different publishers. The subject was my writing style, which the publishers held to be undignified. First of all, they opined, my lack of jargon made me appear unsophisticated, and my repeated use of slang made me seem like I lived in New Jersey. To both of these points, I replied with some of the language for which the aforesaid New Jersey dialect is renowned. Another point was not so easily dismissed. They said, writing in the style you do makes difficult reading for anyone whose first language is not American English. Granted that the overseas market for color books is not a big one, still, we need all the sales we can get, and there is no sense writing off the entire rest of the world. I admitted that there was some merit to this but that I disagreed that foreign sales would be zero. I’ve suspected for a while that nearly as many readers come from foreign countries as my own, although I had no way of knowing for sure. Now that I’m personally involved in the business of publishing, I have better sources of information as to who buys the books and views our videos. So much for the publishers’ fears. In fact, so much for my estimates. If you have bought any of my books or seen the videos, you’re twice as likely to live elsewhere than in the United States. About half of the non-U.S. readers come from countries where English is the first language. I would be very surprised if any other U.S. author in the field has anything close to this kind of ratio. My informants say that typically U.S. sales are three or more times greater than in other countries. Being a fan of my own books, it’s difficult for me to come up with explanations that don’t come across as anti-American. For example, Americans are perhaps more prone to look for easy, pushbutton solutions, the miracle technique that solves all color issues. We may not be up for seriously challenging reads, which my books surely are. A less invidious interpretation might be that Americans suffer from information overload. Someone interested in color correction who’s never heard of me would be able to find out who I was with a little googlng. Anyone interested in buying my current book should be able to figure out whether it’s for them with a little research. I suspect that in other countries, where there isn’t such an overwhelming amount of advertising and online commentary, doing that research is a bit more likely. Similarly, word-of-mouth is likely a bigger factor elsewhere than in the United States. Or maybe it’s just that people are more serious about the topic elsewhere.In most of the world, my book Photoshop LAB Color, which is somewhat accessible to hobbyists, outsells Professional Photoshop Fifth Edition, which contains a lot of CMYK and other material that professional retouchers need but photographers don’t. The ratio is about two to one–except in China, where it’s reversed. Accordingly, more copies of this book may have been sold in China than in the rest of the world put together. Amazon.cn has 148 reviews of it, roughly double the number in English on amazon.com. Even more telling: more than three years after publication (and this is an eternity in book publishing) it appears to be the best-selling translated Photoshop book in China. In the United States, the English-language publisher has allowed it to go out of print. Update 25 July 2014: further to my comments above about the difficulty of reading my text for those whose first language is not English, a couple of Spanish-speaking friends and I are pleased to offer an official Spanish translation of the Introduction. The first pass at the translation resulted in good Spanish but missed the meaning of various ambiguous phrases; after I rewrote it the meaning was correct but the quality of the Spanish left a lot to be desired; and we then had a third pass where my friends made it sound less gringo. The question of why something is the way it is comes up often in color correction. Modern Photoshop Color Workflow mentions at least one case in which I cannot explain why something works as well as it does. There are others where I have an explanation, but I’m not sure it holds water. Eventually, I suppose, I will understand the reasons, but for the time being it is sufficient to know that these things *do* work. So it is with these sales figures. I would like to be more accepted in my own country. But if there must be an imbalance, I’m grateful that it’s the way it is. I travel all over this planet. Everywhere I find friends new and old. who give me back more in showing me their corner of the world than ever they got from me about color. I would have to show you around all of Switzerland in order to give you back as much as I got from you. There may be a reason why non-US sales are bigger. 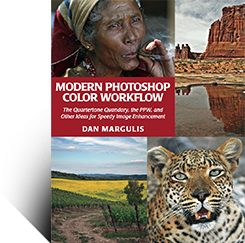 First of all, most people live outside the USA Second, anyone who wants to learn “some Photoshop” or “some color correction” has many options to choose from, including local authors – any country has some. So a common Photoshop book written in the USA has quite a little chance to be bought abroad – there are just too many of them. On the other hand, if someone looks for a serious book like yours, the number of available titles shrinks to a few. The chance that someone around the world buys your book is much bigger – just because there are few substitutes. By the way, it’s true that I have sometimes troubles to completely understand your English, namely some jokes – my first language is Czech. But never mind – I don’t buy your books because of jokes but because of the knowledge inside. And the principles are easy to understand, even if they are hidden in a joke. I don’t mind learning some New Jersey jargon if that enables me to appreciate one of your great books! Being a great fan of your LAB book I can’t wait to read this! First of all you have to excuse my rusty english, I rarly use it to comment material, but this was just so good I couldnt avoid it! I’m not commenting on this article, but I just wan’t to say some nice words about your workflow, team and resources you have provided us with. I would like to thank the whole team for PPW panel/documentation and such, it’s awesome to use and saves a lot of time. I have reccomended this panel, your books and videos to all my friends who use photoshop on a regular basis. I can’t thank you guys enough. This last video you made in collaboration with your team, was amazing. It was about time to make a new one, as the first kelby video was going out of date. Nevertheless, I always rewatch all videos and reread books, just to be sharp on “colors by the numbers” and techniques to improve the final result. My experience is that even if some of your material is growing old, it’s still a good read/movie with entertaining inputs and stories. I recommand you to post the tools in Adobe Exchange, as it is more vauable than anything else currently available there. When I first started using your tools, I had to recheck if it was a trial-panel/period, because I couldnt belive it were free! I will continue to spread the word about the panel, book and videos. I havn’t got around to purchase the book yet, but I assure you -I will.